Do you ever wish life was simple? I mean that we could just get rid of the hard and painful things and not only not have them happen but also not have to learn how to deal with them. Part of me wishes that. Part of me feels like too many things are piling up, and wishes that people would make wise decisions and that being a good friend didn’t have to mean speaking up when they’re making hurtful decisions. Part of me wishes that toilets didn’t leak, or overflow, or in our case both at the same time. Part of me wishes that a healthy grieving process didn’t take so long and that there wasn’t such a fine line between laughing and crying during hard times. But if we didn’t go through hard times I wonder what our relationships would look like. Over the past few weeks between my illnesses, loss of a loved one, our car permanently conking out, and several other crises, I’ve felt more supported than ever. People have been coming around me and showing me such incredible support and love. We were given a free car, we’ve been given fresh fruit and vegetables, people have been stepping up and running our ministries when we can’t be there, and being so patient as I talk about what’s going on. My sister-in-law is coming over tonight to bring me dinner and give me a neck rub (she’s really good! ), and most of all, Eric has been the greatest husband ever. He’s been taking such good care of me for the past few weeks. He brings me my medicine when I start feeling pain, or heats up my hot pack for my ear, he offers to make dinner or draw me a bath when I get stressed. He’s given me backrubs and as many cuddles as I need, no matter how tired he is. When my dad called on Saturday morning to tell me my uncle passed away, Eric was right there with me the whole time. This is the first tragedy I’ve gone through feeling completely supported and safe. So even though I sometimes wish these kinds of things didn’t happen, without them I don’t know if I’d realize how truly fortunate I am. The small, unimportant problems would seem bigger, I’d maybe feel lonelier, and I wouldn’t experience the growth that I have in so many relationships. There’s something about having someone grieve with you that is so deep and special. Now onto the food! I’ve made dinner a few times the past week, mostly it’s been comfort food like scrambled eggs with potatoes, peppers, onions, and cheddar, or guacamole (which I will post soon!). This dish was pretty comforting and really simple to make. I love pesto, but I can’t afford to buy fresh basil, and have killed all the basil plants I try to grow in our apartment. Sometimes I just use a mix, but even that was $2.50 a package the other day which I thought was absolutely ridiculous. But last night was St. Patrick’s Day and I wanted green pesto for dinner! 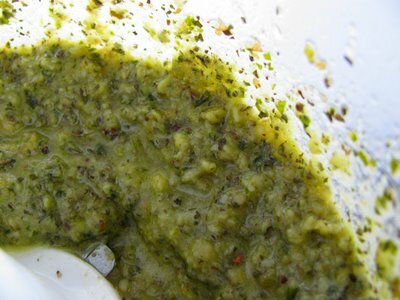 So I went through our cupboards and fridge and discovered that I had everything I needed to make a great tasting pesto. In my fridge I have tubes of those Gourmet Garden fresh herb pastes and one of them is basil. But I didn’t want to use it all in one dish, so I combined it with dried basil. I don’t really use pine nuts but I had walnuts in my freezer that worked great. In keeping with the green theme I went with frozen peas and fresh baby spinach. It was such a simple dish to make, only cooking required is boiling water, and because I buy everything that I used in bulk, it costs less than $1 a serving! Amazing I know! 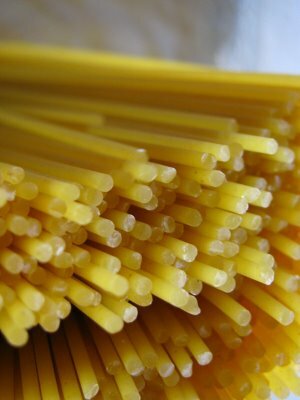 Boil a large pot of water and cook pasta according to package directions, adding sea salt to the water. In the last two minutes of cooking add peas and spinach to the water. 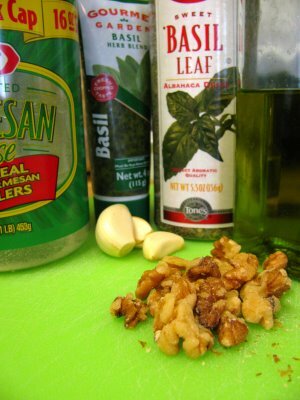 While pasta is boiling, combine basil, parmesan, walnuts and garlic in a food processor. Drizzle olive oil in until smooth, season with salt and pepper. Drain the pasta/peas/spinach in a colander. Put them back in the pot, top with pesto and mix well. Toss with feta. You have a winner of a husband and great friends. It’s through times of tragedy that we learn the true color of people and ourselves. Thanks for the candor and the great bowl of pasta. Very brave of you to share your life along with your recipes. Usually when things like this happen, it means you’ve got some good things coming around the corner soon. 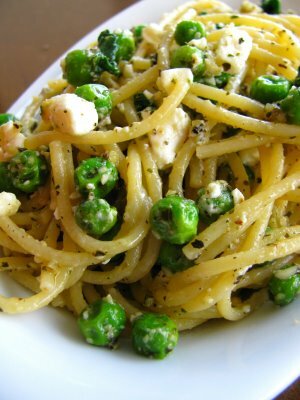 Beautiful post – both your honesty and your pasta. It looks delicious. You have some wonderful people in your life, it was nice reading more about you. I love anything pesto. Since my herb garden is nowhere near ready I need another approach…this one looks like a winner! 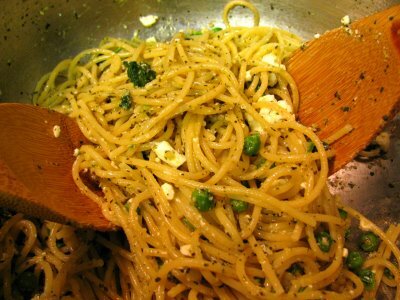 Your pesto looks lovely ! My goodness that looks good. I am so sorry you are having to go through all that you are, but I am so glad that you have folks around you to help out. Really it is a blessing. Having a loving family and friends is the best gift in life. As for basil… Trader Joe’s sells gigantic pots of basil for about $3 and they last a loooong time. You can even plant them. Don’t remember when they start selling them, but probably soon in the spring/summer. wow, thanks everyone for your wonderful comments. And thanks Nurit for the Trader Joe’s tip. Now that I get a little sun coming in the window I’ll look for one.